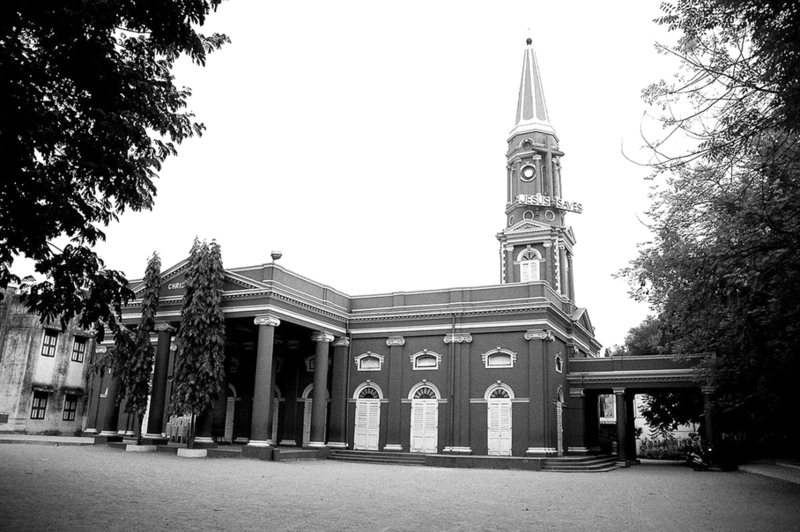 Tucked away unassumingly between a complex of cinema theatres and a popular social club on Anna Salai, the majestic spire of Christ Church soars into the sky, symbolising the eponymous School’s motto, “Do Your Best”. The school certainly has, overcoming a maze of problems and hurdles of all kinds. As I entered the portals of Christ Church High School on the occasion of the celebrations of its 175th birthday, I could not help but feel a lump in my throat for I had left the school sixty years ago and never had an opportunity to visit my Alma Mater again. Entering the Church, I stole a glance at the pipes of the organ and recalled how an Irish Chaplain moved us with those timeless hymns, ‘Lead us Heavenly Father’, ‘Yield not to Temptation’, ‘Calvary Tree’ etc. Those were the days when we sat on its steps and rushed through our lunch boxes so as to catch a short game of Hockey before the post-lunch bell summoned us to our class-rooms. I thought of the school’s hockey stalwarts like Maurice Timms (son of a Deputy Commissioner of Police then) and Eugene Edmonds and a couple of other Anglo-Indian school-mates as well as some Chinese like Robert Chen Benchu and Pen Lo, who migrated to Australia and New Zealand many decades ago. The School and the Church are steeped in History. The School was founded in 1842 by Thomas Parker Waller. Esther Linley Harris, historian and genealogist of the Waller family, who had come from Australia, inaugurated the proceedings with a moving speech. But I was distracted by my own nostalgic thoughts; I cast a longing glance at the rear to catch a glimpse of a picture of Christ with the following legend at the bottom: “Behold, the kingdom of God is within you.” (Unfortunately, because of the heavy cluster of people in that corner, I was unable to see it). After the speech by Ms Harris, there were a number of songs and dances of a rather pedestrian variety by the current students which left you feeling rather embarrassed. I wondered what the genteel lady would have thought of them; she did maintain her stoic composure and revealed no signs of discomfort at the onslaught of cacophony. What a contrast from the good old days when Shakespearean plays were staged by the School’s students, conceptualised by David Samuel, our teacher, who stood for all that was perfection in pedagogy ! The next part of the programme relating to acknowledging the contribution of the teaching staff with mementoes drew well-deserved applause. My thoughts raced to our own group of teachers of the Class of 1957 who had groomed us painstakingly to serve society, the nation and our own homes as responsible citizens. The teaching faculty of the Class of 1957 represented all that was best in building up students for a great career in the years ahead. We had a formidable Headmaster in John Asirvatham who raised the standards of education and was primarily responsible for enhancing the reputation of the hundred-year old (then) institution. A feeling of fear, mixed with respect, tingled through our spine whenever he walked down the corridor and casually cast a glance in the direction of our class. He would be the first to assemble for Prayer in the morning; after a hymn was sung, he would give a short homily before ending with the Lord’s prayer and specifically intoning the following words with great emphasis and clarity: “May the Grace of God and the Fellowship of the Holy Spirit be with us this day and forever more”. (Even now, after a hiatus of sixty years, those words are impressed indelibly into my psyche!). His alter ego, David Samuel, was an institution by himself. He taught us to love the nuances of the English language (“as she is spoke”) and treated Wren and Martin as a Bible! He easily raised us above the level of Lamb’s Tales of Shakespeare and made us appreciate the Bard of Avon in his own inimitable style. He identified a small bunch of us and taught us Advanced English at his home on Sunday afternoons while his wife plied us with biscuits and orange juice. Soliloquys from Shakespearean plays and couplets from the Lake Poets used to flow from his lips while he joked about spoonerisms, malapropisms, figures of speech, mixed metaphors and the quaint use of idioms. His eyes would sparkle when he lauded Tennyson’s use of onomatopoeia in his famous poem, ‘The Brook’. The other day when I rang up an old classmate who was keeping indifferent health and indulged, as was our wont, in a bit of “Samuel-speak”, he quoth: “I wasted Life and now doth Life waste me”! It was indeed a pleasure to hear Samuel play the piano in different moods – be it in the Assembly Hall, Church or at his home. Our Tamil teacher, Subbiah needs a special mention; some of us in the classroom would occasionally send out a wave of giggles whenever we saw him bravely coaxing a motley group of Sindhi, Jain, Punjabi, Chinese and Anglo-Indian students into reading some passages from their Tamil prose book! The organisers did also recognise and applaud some top retired Government officials who had passed out with rankings around fourth or fifth in 1966. Before moving over for Dinner, I accosted a couple of the main organisers and mentioned that they had erred in their HISTORY! Had they gone through the School records correctly, they would have spotted one V. Kalidas who ranked SECOND in the State and was even felicitated in a public function along with the first and third State Rankers in 1957. I also happily pulled out the medal from my jacket which my wife had thoughtfully given to me to be shown to Harris, which I found too delicate to do. It was a memorable evening meeting with old friends and classmates, hewn into different shapes and forms, by Father Time. My class-mates, Col. Kohli, (Retd.) and S. Radhakrishnan, (retired Chairman, TNSC Bank) called earlier in the day. It needs to be mentioned that the school continues to churn out top guns in the Defence and leaders in Business and Governance.